The Rescuers and The Fox and the Hound are two of the more well-known movies of the “forgotten five.” They are, also, the two oldest movies of the five. I remember seeing both movies as a child. Both movies have great voice casts with Bob Newhart and Eva Gabor in the The Rescuers while The Fox and the Hound had Mickey Rooney and Kurt Russell. They, both, did very well in the theaters. 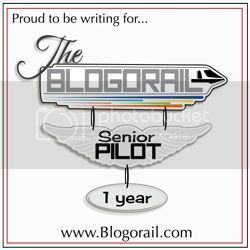 Then, there was a four-year gap between The Fox and the Hound and the next release….The Black Cauldron. The Black Cauldron had a couple of things working against it. First, it had no big-name actors in the voice cast. Second, it was the first Disney movie since 1959 to have a PG rating. As a result, it was a money loser for Disney as its box office take did not match it’s budget. The Black Cauldron was a very dark movie for a Disney movie. It did not have that sense of Disney charm and pixie dust that most people associate with a Disney movie. Many people believe that Disney wasted a good book and story on a such a poorly made movie. 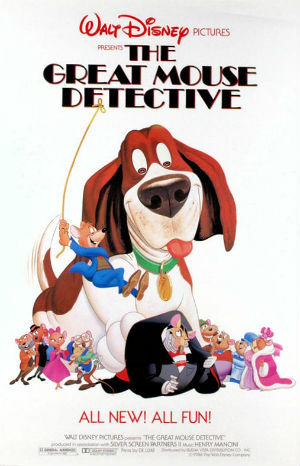 Disney returned a year later with a back-to-basics with The Great Mouse Detective. Disney went with characters that people associated with Disney…mice. 🙂 Much like Dumbo did 40 years prior, The Great Mouse Detective showed people that Walt Disney Animation was not dead and could still make a movie that got people into the theaters. Like The Black Cauldron, it did not have a strong voice cast. But unlike The Black Cauldron, it did not have a large budget. The animation department was forced to do more with less. And they succeeded, they made a profitable movie and a movie which people wanted to see. That leads us to the last movie in the “Forgotten Five,” Oliver and Company. Oliver and Company has most in common with The Fox and the House and The Rescuers. It’s a tale that involves cats and dogs living and singing together in New York City. It brings in a big name cast again with Billy Joel, Joey Lawrence, Dom DeLuise, Cheech Marin, and Bette Midler voicing and singing for some of the animals. These movies when looked as a group of five movies make a perfect U-shape. The Rescuers and Oliver and Company were the most successful of the five. The Fox and the Hound and The Great Mouse Detective were successful but did not have the success of the other two movies. While The Black Cauldron represents the low point of Walt Disney Animation Studios for this group of movies. These movies, especially The Fox and the Hound and The Rescuers, are movies from mine and a lot of current adults, who are bringing their kids to Walt Disney World, youth. Can Disney please bring some part of these movies into the parks so we, adults, can relive our youth from the Disney movies that we grew up with and introduce these movies to our children. I’m not talking about anything grand like an 80’s movie land at Hollywood Studios (though that would be pretty cool) but maybe a meet-and-greet, a themed restaurant, a show, an attraction, something for us to enjoy and re-live the scenes from these movies again. It’s like you found a list of all the Disney movies I’ve either never seen or never seen until very recently. 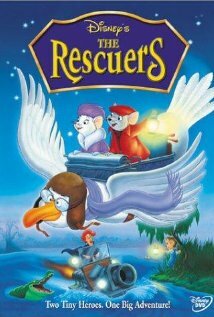 I saw The Rescuers years ago, but have only seen it maybe twice. Until a year or two ago, I’d never seen The Fox & The Hound and The Great Mouse Detective. I still haven’t seen Oliver & Co. or The Black Cauldron. I really need to see them! Oliver & Co. looks like a cute movie! Thanks for sharing these forgotten Disney movies with us! No problem. The Rescuers and The Fox and the Hound are definitely my favorites out of the group.